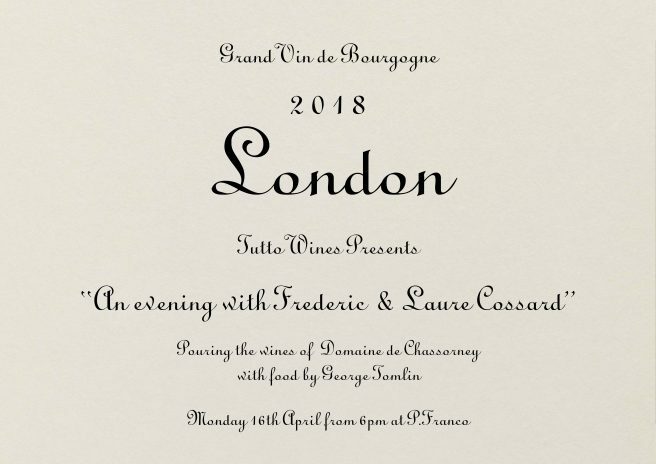 On Monday 16th April we welcome Frederic and Laure Cossard of Domaine de Chassorney to London to share their wines for the very first time. Fred is a larger than life character. He is a man with an infectious joie de vivre, a real passion for life and a love of wine that runs deep. Not born into a family of vignerons, he started his Domaine de Chassorney in 1996, working organically from the outset and over the last few decades has become known for producing Burgundy of rare liveliness, purity and detail. From 6pm the Cossards will be taking over the bar at P.Franco on Lower Clapton Road. They will be pouring a large selection of their wines by the glass, including the rarest of rare cuvées and top crus from bottles big and small. If we are lucky, Freddy might even mix up a few of his infamous G&T’s. P.Franco’s chef in residence George Tomlin will be behind the hallowed hobs and has written a beautiful menu to complement the wines. There is no need to book and everyone is welcome so please drop by to meet the Cossards and share a glass or two.